senseFly continuously strives one thing really well in farming drone development. senseFly focused on developing the ultimate high-performance, high-value, unmanned system for agriculture. A drone that can capture accurate data precisely, that provides reliable insights into the real health of your crops. A drone that can fly for longer allowing you to assess more crops with each flight. And a drone that fits neatly into your existing AgWorkflow. Working seamlessly alongside the farm management information system and Ag equipment you already use. And all at a price that suits your farm our agronomy business is budget. The result is the most fully featured cost-effective farming drone launched to date, it's called the eBee SQ. The eBee SQ is built around Parrot's groundbreaking Sequoia camera. This fully integrated and highly precise multispectral sensor, captures data across 4 spectral bands, and visible RGB imagery in just one flight. The produced data Sequoia allows you to generate precise index maps such as NDVI whose findings you can rely on to create or recommend the highest quality prescriptions as well as useful RGB Maps. Helping you to carefully optimize crop treatments to improve production quality, boost yields and reduce costs. The eBee SQ can cover hundreds of acres in a single flight up to 10 times more coverage than popular small quadcopter drones, for extremely efficient crop monitoring and analysis. The result is fewer flights, less time spent collecting data, and more time acting on it. Thanks to its farming focused eMotion Ag software, the eBee SQ is compatible with your existing Farm Management Information System (FMIS), ag machinery and workflow. So there's no need to reinvent how you work. 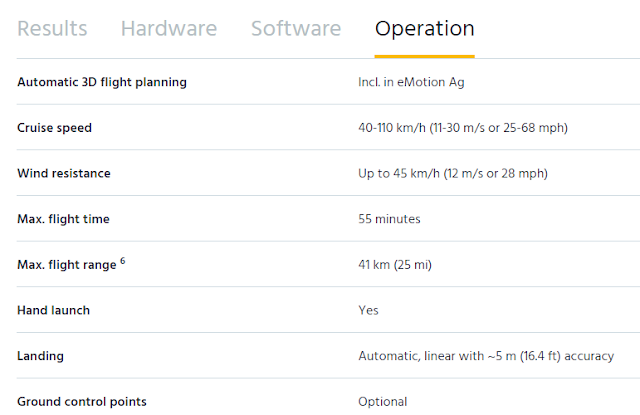 The eBee SQ's flights can be planned using field boundary data imported directly from your FMIS. Takeoff and capture the geo accurate imagery needed to create actionable data that is itself immediately compatible with your FMIS and precision farming machinery. As with all senseFly drones, the eBee SQ is so simple to use anyone can operate it, no flying skills required, backed by our trusted global service and support. With senseFly remarkable track record of eBee durability. The eBee SQ precise crop data, large coverage, and workflow friendly from the world's number one choice producer of professional mapping drones. 0 Response to "Dozens of Reasons to Buy eBee SQ Agriculture Drone"